Direct from Lightroom to Instagram. LR/Instagram is an unofficial publish plugin for Lightroom, allowing you to post photos directly to your Instagram account. 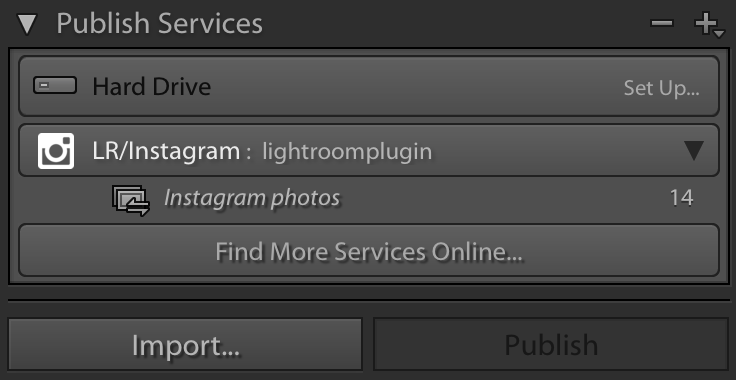 Simply install the plugin, add new service in Lightroom Publishing Manager and authenticate with your Instagram account. Drag photos to the publish collection, then click Publish to immediately upload your photos to Instagram. 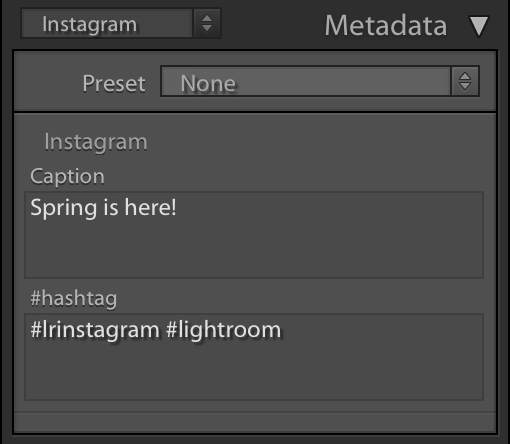 There simply is no faster way to publish from Lightroom to Instagram! You can add post-process action to force cropping of photos to aspect ratios supported by Instagram (4:5 through 1.91:1). Or simply use the automatic padding with white border, which is enabled by default. LR/Instagram allows you to publish to multiple accounts simply by creating new publish collections. You can download and try the plugin for free. If you like it, please register it for $10 from Lightroom Plugin Manager. After downloading the ZIP file, please extract the contents to your home directory. Open Lightroom Plugin Manager, click Add and navigate to the directory where you extracted LRInstagram.lrplugin. on Windows XP (or later) and Mac OS X 10.7 (or later). Instagram has updated their protocol in start of September, which caused a little old bug triggering a fatal error. please download the latest version of the plugin (currently 0.6.1592), which should fix the issue. This issue has been fixed in plugin version 0.6.1592, please download the latest version. This video tutorial is helpful way to get you started, it includes installation, setting up and publishing. The plugin session is no longer valid, please go to publish settings, logout and then login again. Plugin does not support logging in with a Facebook login yet, you need to authenticate with a password. If you don't have a password, there is a forgot password option in Instagram app's Add Account screen, where you can create a new password. 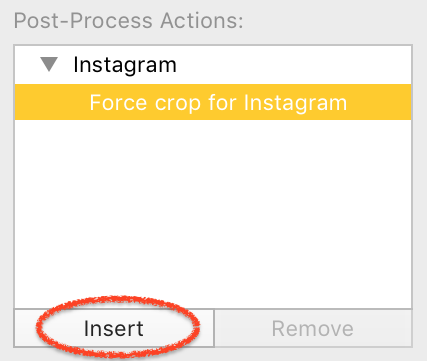 "Please update your Instagram app to continue posting"
Some users have reported this error on publish, and that the error goes away if they remove hashtags and/or usertags from the photo. I'm investigating the issue, but I have not yet managed to reproduce the issue with my account. If you modify photo after publishing, the photos go to "Modified Photos to Re-Publish" state. Since it is not possible to replace a photo in Instagram, the photo content is not actually updated from this state. Since plugin version 0.5.1435, the plugin does update caption on republish. To publish photo again, you need to delete photo from collection, publish changes, add photo back, and publish again. This error indicates a connection error. Plugin does not use system-wide proxy settings, so if you need a proxy to connect to outside world, you need to configure HTTP Proxy settings in Lightroom Plugin Manager. Are you using AVG security software? It intercepts the traffic, uses fake certicates and does not even understand protocol properly, so there is no way to make it work. Sorry. Feel free to email us to provide some feedback, give us suggestions for new features, or to just say hello!